There are 19 Assisted Living Facilities in the Kenmore area, with 4 in Kenmore and 15 nearby. The average cost of assisted living in Kenmore is $3,430 per month. This is higher than the national median of $3,346. Cheaper nearby regions include Buffalo with an average starting cost of $2,950. To help you with your search, browse the 126 reviews below for assisted living facilities in Kenmore. On average, consumers rate assisted living in Kenmore 3.5 out of 5 stars. Better rated regions include Tonawanda with an average rating of 4.1 out of 5 stars. Kenmore is a cozy village near the Buffalo-Niagara Falls metropolitan area that was once named the “One of the Top 10 Great Neighborhoods” in the United States by the American Planning Association. Kenmore has a population of 15,217, approximately 18.1 percent of which is aged 65 years or older. Those seniors have access to 27 assisted living facilities in and around Kenmore, all of which qualify as adult care facilities (ACF) under state guidelines and are therefore regulated and monitored by the New York State Department of Health. Kenmore boasts pleasant summers with highs around 81 degrees Fahrenheit, but the winter climate is less welcoming, with an average of 85 inches of snow per year. Seniors with medical issues exacerbated by cold temperatures may find winters in Kenmore difficult. Thanks to an overall cost of living well below the national average, Kenmore is an affordable place to live for seniors on a budget. Seniors in Kenmore have access to a wide range of arts and culture, much of which is located a mere 15-minute drive away in the Buffalo-Niagara metropolis. Options include museums and events in Buffalo, the Albright-Knox Art Gallery, and concerts at Kleinhans Music Hall. The NFTA-METRO controls the main public transportation routes through Kenmore. Passengers 65 years of age and older are eligible for the NFTA-METRO Reduced-Fare card, which can be used during off-peak hours. The Kenmore area is home to world-class medical facilities, including Kenmore Mercy Hospital and Mercy Hospital of Buffalo, in the event of medical emergencies or illness. Kenmore has an array of community resources for seniors, including Erie County Senior Services, which offers a range of long-term services and support, and more than a dozen senior centers. Assisted Living costs in Kenmore start around $3,430 per month on average, while the nationwide average cost of assisted living is $4,000 per month, according to the latest figures from Genworth’s Cost of Care Survey. Low-income seniors interested in other long-term care options, such as assisted living, are limited to two Medicaid initiatives: the Assisted Living Program (ALP), which helps medically eligible seniors locate proper assisted living placement, and the Consumer Directed Personal Assistance Program (CDPAP), which facilitates both in-home services and assisted living care. To see a list of free assisted living resources in Kenmore, please visit our Assisted Living in New York page. Kenmore-area assisted living communities must adhere to the comprehensive set of state laws and regulations that all assisted living communities in New York are required to follow. 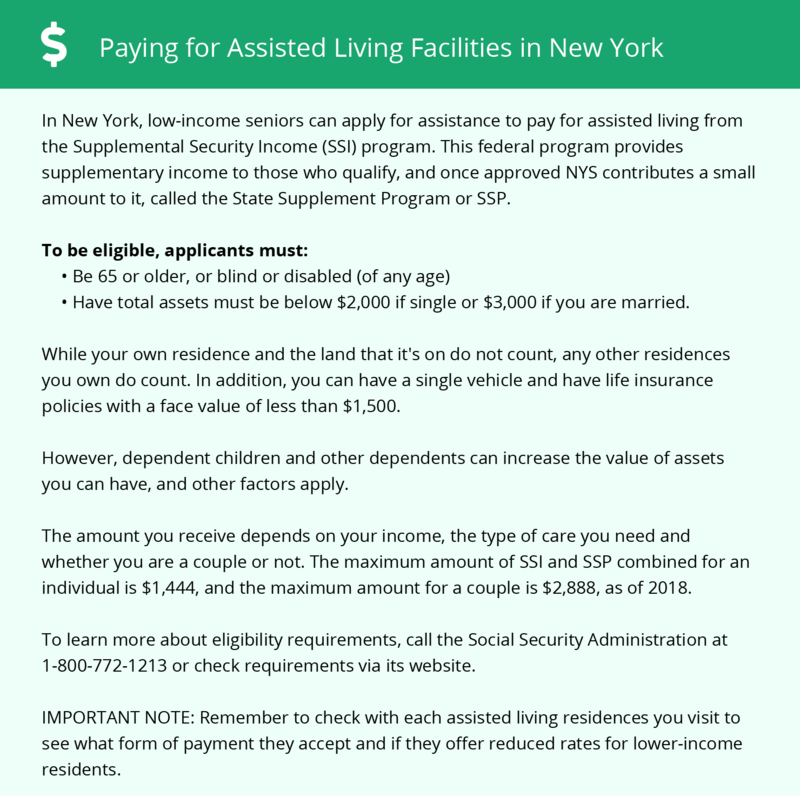 Visit our Assisted Living in New York page for more information about these laws.